As a dad myself, I have to admit to feeling a kindred spirit when I first found out about CERBASI TREK – THE SEARCH FOR NICHOLAS. The Cerbasi family lives in the town of Reading in the United Kingdom. “Captain Daddy” WAYNE CERBASI has two sons, PETER (almost 12-years-old) and NICHOLAS (9-years-old). And a few months ago, they made a 16-minute Star Trek fan film. We’re not talking Star Trek Continues or Axanar here. This was just a fun little project for a father to do with his two kids. And that’s what fan films are all about, right? FUN! And hey, if you can bring a few new fans from the “next generation” into the fold, so much the better. 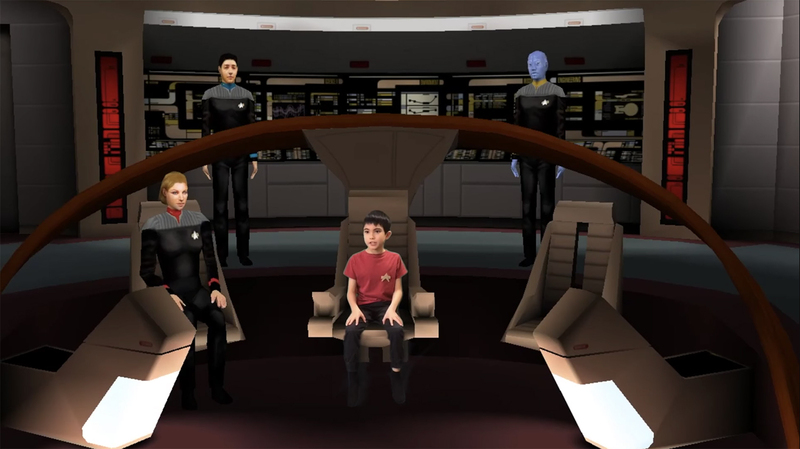 Much of this film is done in “machinima” style, which is a production technique where the filmmaker records computer graphics rendered in a video game engine (like Star Trek Online or Elite Force or Bridge Commander) and edits them to tell a unique story with characters and space scenes…all without having to know how to create actual visual effects. Machinma fan films have existed 1996, when a filmmaker used the first-person shooter game Quake to create a video short story called “Diary of a Camper” with game scenes and text-based dialog. Since then, many Star Trek fan films have used the technique, including, for example, the multi-episode Borg War. JONATHAN – First off, Wayne, great job on your first Star Trek fan film with you and the boys. It is your first, yes? WAYNE – Thanks. Yes, it was the first with Peter, Nicholas, and me. 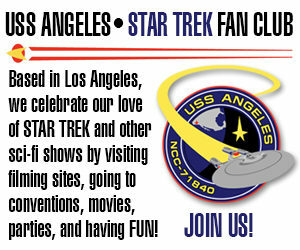 JONATHAN – So I’m guessing all three of you are Star Trek fans, correct? Which series is each of your favorites? WAYNE – The boys are of the age where anything space is interesting. Star Trek and Star Wars are big at the moment. I grew up with the original movies but also watched the original series and some of the Next Generation TV and movies. I started showing them the movies and TV shows about a year or so ago. Nicolas likes Voyager the best, and Peter likes the original series and movies. JONATHAN – Awesome. Have you watched Star Trek: Discovery yet? If so, what do you guys think of it? WAYNE – We have not yet seen Discovery. We have seen the new JJ Abrams movies, but we all feel that the older shows and movies are better. JONATHAN- You’re not alone, mate! So have you watched any Star Trek fan films (besides your own)? If so, what do you think of them? WAYNE – We were not really aware of the fan film community when we started. I did a quick search on Youtube as were were finalising our movie. The slickest thing we have seen is Star Trek Continues. JONATHAN – What made you guys decide to create your own Star Trek fan film? WAYNE – The boys watch a lot of Youtube game play channels, many of which use green screen, and I suggested that instead of watching people play games, that we should try and make a green-screen movie ourselves. JONATHAN – How long did it take you to produce this project, and was it fun or hard work…or both? WAYNE – It took about 3 months to put Cerbasi Trek together using spare time I had in the evening and over the weekends. Some parts of it (like the editing and green-screen) were difficult, but it was a lot of fun to do. We all had a great time making it, and we are pleased at how well the movie turned out. JONATHAN – Who wrote your script? WAYNE – We didn’t really have a script. It started with the boys to saying generic Star Trek phrases in front of the green screen. We had a basic plan that Nicolas would get into trouble and Peter would come to his rescue. The story evolved as we put it together. We only thought to add my part as a bit of a joke while the boys were doing their green -screen bits. JONATHAN – Your film has some very nice machinima animations in it. What video game or games did you use to generate the animations of the ships and the characters? WAYNE – The animation was taken from the old BRIDGE COMMANDER Star Trek game using the “Kobayashi Maru” mod. I used to play the game a lot when I was younger and always thought it would be a good tool for making a Star Trek movie. All the green screen work and editing was completed using Apple iMovie. JONATHAN – I see that the background score was mostly written by you, Wayne, but Peter and even Nicolas did some composing as well. You must be a very talented family! How did you and the boys create your music? WAYNE – We all do weekly guitar lessons; Peter and I have been going for about three years, Nicolas has been going for nearly two years. We did the music last. It started as an experiment as I wasn’t sure we would be able to come up with songs that would fit. Each song took a few hours to make. “Composing” is a strong word—all we did was ad-lib simple chord progressions and riffs in Garage Band over the automated drum beats. Nicolas did some of the guitar on a few of the songs. Peter did a number of the songs entirely on his own. I think the music turned out really well and gives the movie an extra dimension. JONATHAN – Yeah, it’s a pretty catchy riff. So looking at the way Cerbasi Trek turned out, is there anything you think you should have done differently or would do differently in the future? WAYNE – We are all very proud of the outcome. It came out far better than I had hoped. I don’t think we could have made it any better or done anything differently with our current methods. I keep asking the boys what are we going to do for Cerbasi Trek 2? They are keen to do another one, which we probably will do at some point. My only concern is that we have pretty much pushed the limits for our movie-making method, and I expect anything we do will look too much like Cerbasi Trek 1. JONATHAN – Didn’t you already do another Trek fan film after Cerbasi Trek? I thought I saw one where Peter visits all the planets in our solar system. We went to peter’s school this week for parent teacher interviews. The science teacher said she was blown away by his solar system movie and the drama teacher gave him an “Excellent” and said she was impressed with Peter and how he was able to get into the character roles. I asked Peter about his drama classes and he said he really started to get into it after making Cerbasi Trek. JONATHAN – That’s totally awesome. And yeah, he really did do an excellent job. But that doesn’t count as Cerbasi Trek 2, huh? So when do you think you might make the sequel? JONATHAN – Well, let me know when you do, and we’ll cover it here on Fan Film Factor. You all did a FANtastic job! WAYNE – Thanks, Jonathan. We really appreciate your interest and kind words. Nice to talk to you. Previous Previous post: First TRAILER for DISCOVERY S2 shows NEW STARFLEET UNIFORMS!